Any female gardener young and silly enough to belong exclusively to the 'Girls Can Do Anything' club - this series of articles is not for you! It contains helpful hints for the manipulation of non-gardening partners (or NGPs) into generally helping in the garden. This, the first article, deals with DIY paths. The concept of DIY for older-lady gardeners is flawed. Any senior woman gardener who talks about 'building a pond' or 'creating a rockery' is probably not telling the full story. 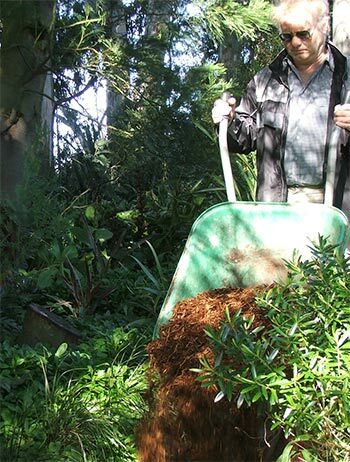 Usually NGP, Non-Gardening-Partner, has a mate with a digger (or bulldozer). There's no shame in using the skills that NGP might possess. Harmony in the relationship can be enhanced, and jobs can certainly be finished faster. Paths, important features in the layout of a garden, are a good starting point for the involvement of NGPs. Paths are non-threatening and need minimal upper-arm strength. There can be no feeble excuses, either - helping with a path won't blunt the chainsaw or wreck the ride-on mower. 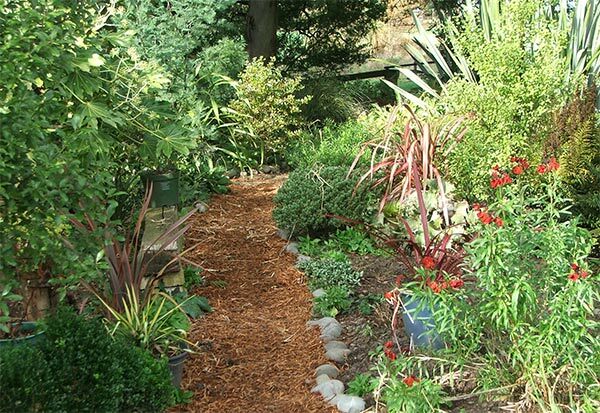 Wise gardeners know that paths are often on the move - edge plantings expand, old routes become overgrown, garden areas are always requiring new access ways. Moveable edging like stones, or pieces of wood redirected (i.e. pinched) from the woodshed are brilliant. And so the basic pathway is easily dug and laid, without outside advice or physical help. Earth paths need weeding, and sensible gardeners will organise some sort of path surface. 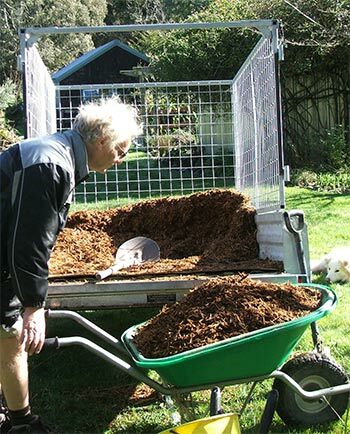 A covering of wood shavings or bark mulch will appeal to the flexible-minded. Enter Non-Gardening Partner. He will drive the trailer, and be in sole charge of the wheelbarrow. Forget the fact that you can, for example, drive a forklift. 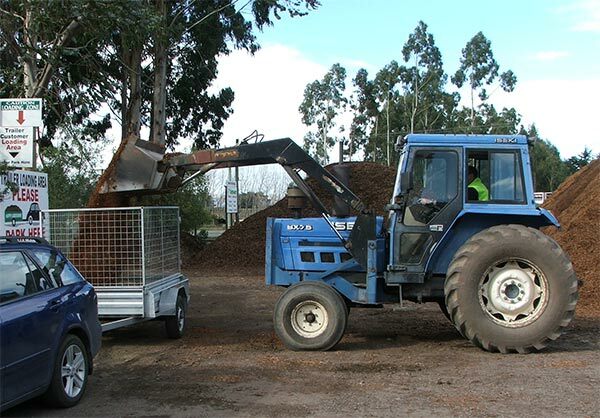 It is much nicer to be the passenger when a load of mulch is being picked up. The passenger can day-dream about new roses and heritage fruit trees, while NGP parks, stomps on the trailer load - and possibly pays. Oops. Hee hee. NGP will take up this subtle challenge, claiming that he could probably shift the lot in fifteen minutes. As he reaches for the long shovel, obliquely compliment him. If you can't think of anything original, comment that the shovel is really heavy and huge - it must be so difficult to use. 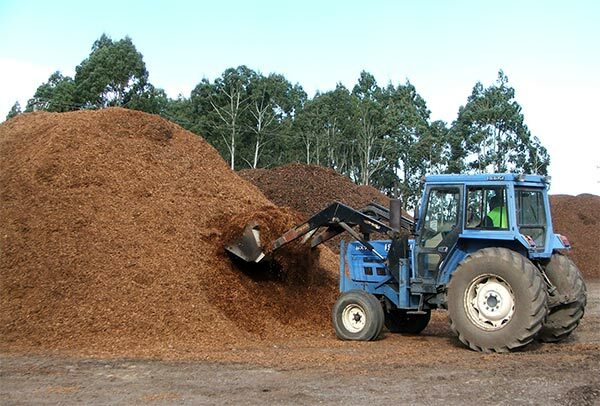 Can NGP really shift all that mulch in fifteen minutes? Finally, you must be seen to give generously of your valuable time. Offer to show NGP exactly where each wheelbarrow load is to be dumped, and - most importantly - tell him not to worry. You will do absolutely all the raking required. Later on, make sure you cook a great evening meal, and for the next few days pop into general conversation phrases like 'I love the new path'. Don't be afraid to seek reassurance - does NGP think the path looks better? He will probably nod vaguely - this is completely normal. Finally, if you plan to take photographs, always ask permission. Make sure that NGP's shirt is tucked in, and crop the pictures so he doesn't look too fat in the belly. Hee hee. Voila! The Path is Finished. NGP for the purposes of this article is a male, though the strategies are equally viable for a female. You just have to change all the pronouns! And crop the photographs so that 'she' doesn't seem to have a big bottom! Oops.